Brunell led the Univ. of Washington to a Rose Bowl triumph following the 1990 season but suffered a knee injury the next year that made teams wary of him during the ’93 NFL draft. He was picked by Green Bay in the fifth round and backed up durable QB Brett Favre for two seasons, seeing no action at all as a rookie. Nearly traded to the Eagles, he instead was dealt to the expansion Jaguars in 1995. The mobile lefthanded passer took over the starting job seven games into the season and passed for 2168 yards with 15 TDs against 7 interceptions while rushing for 480 yards with a per-carry average of 7.2. Jaguars went 9-7 to finish second in the AFC Central and qualify for the postseason as a Wild Card entry while leading the NFL in passing yards (4110). Won AFC Wild Card playoff over Buffalo Bills (30-27) and AFC Divisional playoff over Denver Broncos (30-27). Lost AFC Championship to New England Patriots (20-6). 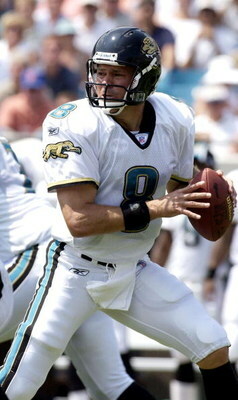 Brunell followed up with another Pro Bowl season in 1997, although hindered by a knee injury that forced him to wear a knee brace, and the Jaguars again made it to the playoffs for the second of four consecutive years. He made the Pro Bowl for a third (and last) time in 1999 but the team came up short in the postseason and began to deteriorate thereafter. Tough and a good leader as well as effective passer, Brunell became less mobile and more battered over time and finally lost his starting job to rookie Byron Leftwich in 2003. He was traded to Washington in ’04 and had one last significant season in 2005, passing for 3050 yards and a career-high 23 TDs as the team reached the playoffs for the first time in six years. Brunell started nine games in ’06 and again yielded the starting job to a young quarterback, Jason Campbell. He finished his career with two years apiece as a backup with the Saints and Jets. Overall, he passed for 32,072 yards and 184 touchdowns, with 25,698 of those yards and 144 TDs coming with the Jaguars, who went 63-54 in the regular season and 4-4 in the playoffs with Brunell behind center. He also rushed for 2421 yards and 15 touchdowns.